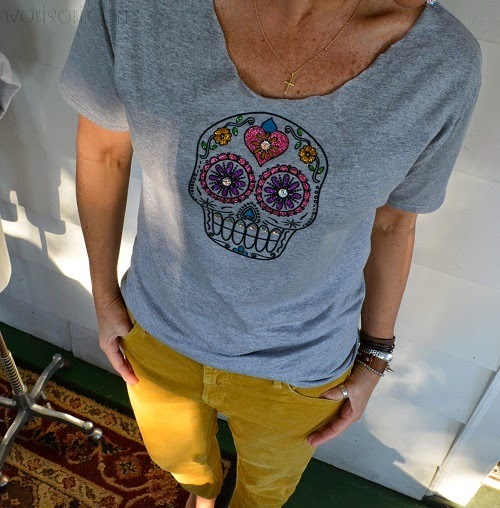 Crafty Chica, Kathy Cano-Murillo has a new line of Day of the Dead crafting amazingness! If you have not seen it you have to go and check it out HERE. 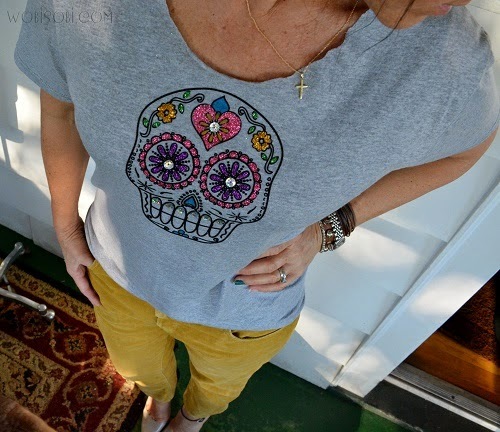 When I saw this iron on Skull applique I had to make a Shirt. 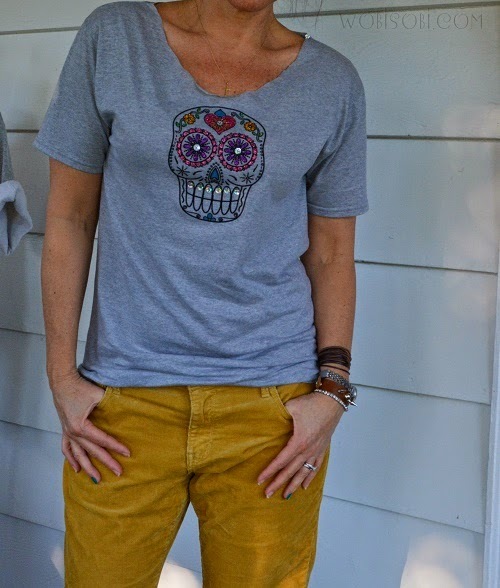 Not only does Kathy designs her own craft line, she runs a Blog a Youtube channel and is a full time Mother and Wife. She is an inspiration to everyone around her. FYI, it's available at select Michaels stores and will also be able to order online through iLoveToCreate.com and Amazon.com. 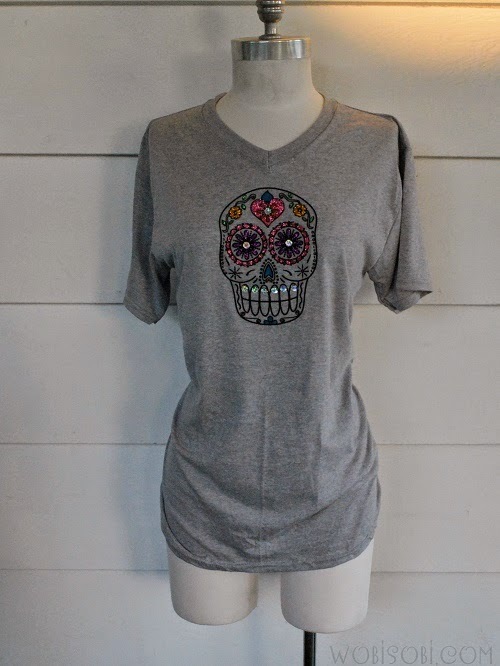 T-shirt *mine is a Hanes mens small v-neck. 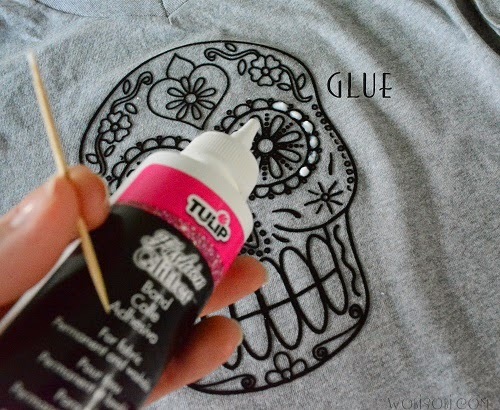 Crafty Chica's Flocked Iron on Skull Transfer. 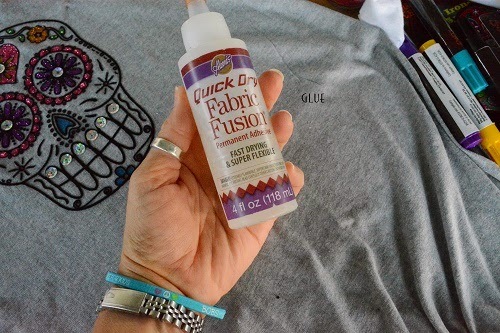 Aleene's Quick Dry Fabric Fusion. 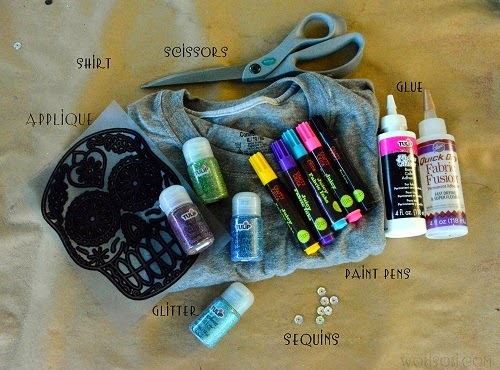 Crafty Chica's Fabric Paint Pens. Wash and dry your shirt. I cut the collar off of my shirt but you could leave it on if you want. 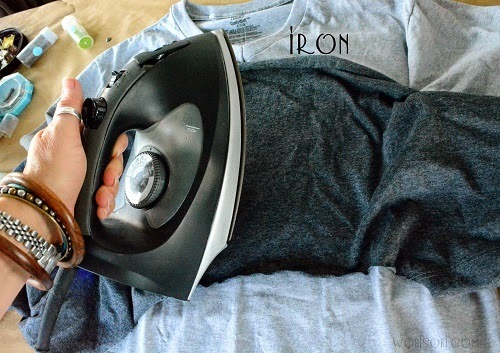 Place your shirt on a hard surface then place a piece of cardboard in between your shirt. 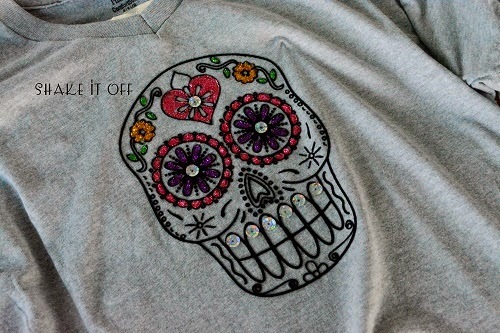 Lay your skull applique down, plastic side facing up. 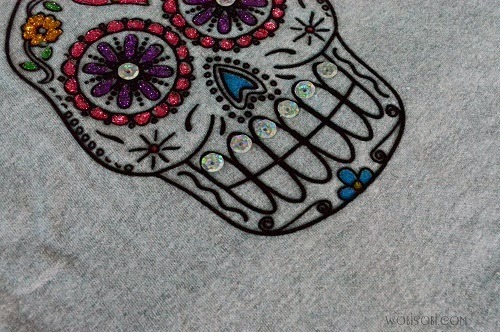 Place a cloth over your applique. Iron over the applique for at least one minute. Tip *I checked mine in the corner every so often. I had to go over my applique a couple of times to make sure it adhered well. 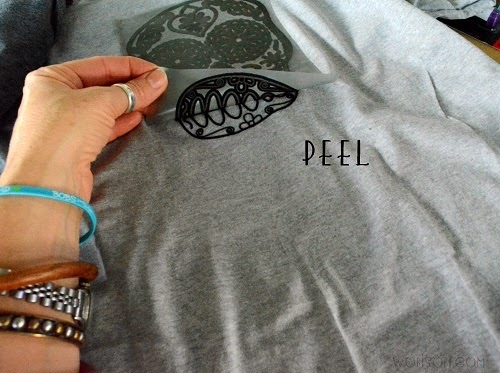 Carefully peel off the plastic. Now let's make him sparkle. color him anyway you want. 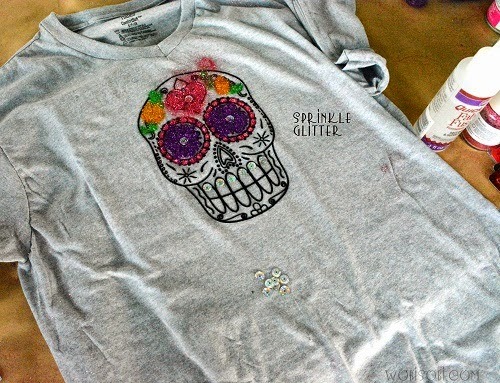 More Glue and More Glitter. Let it dry for about an hour or so to let the glitter set up. 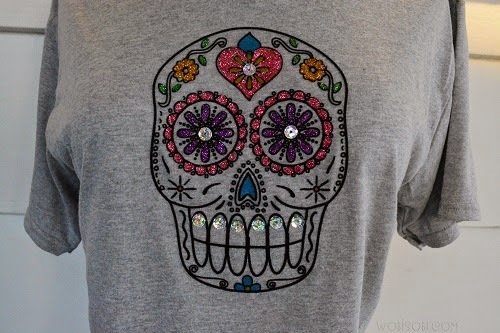 Now let's add a few sequins. 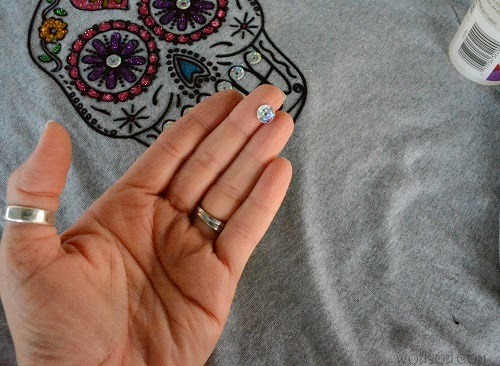 Take you fabric fusion quick dry glue and place a small amount on the back side of a sequin and place them on the eyes, teeth,on the heart. Put them wherever you want. 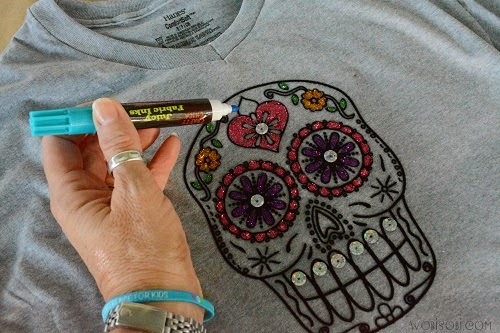 These Fabric markers by the Crafty Chica are so vivid and so easy to work with, I love them. I used them to add different colors where I did not want glitter. 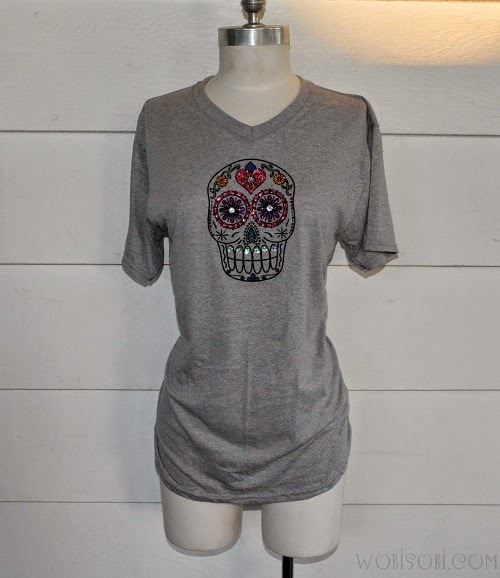 Let your new creation dry over night then wear out and display your craftiness. with Kathy's Craft line in the weeks to come. 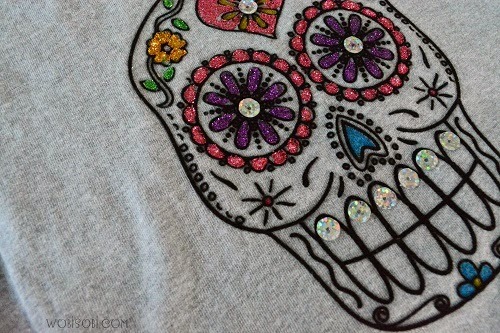 me ha encantado, me encantan este tipo de calaveras. The colours are so bright! you did a beautiful job! I loved this idea so much that I made one last night. 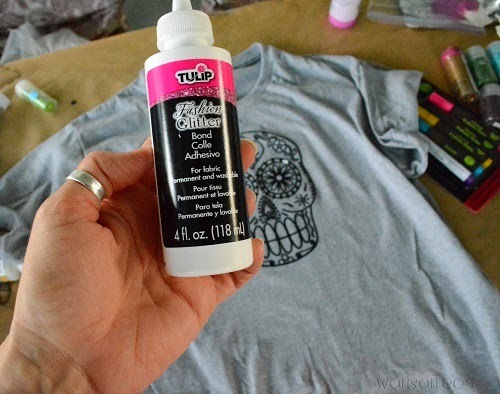 Found shirts on clearance for $2.00 and used a coupon for the markers. My total cost was under $10.00 and it turned out AWESOME. 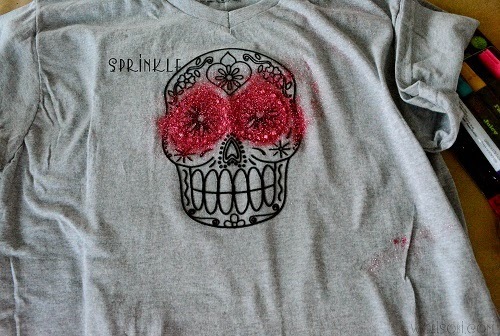 This was the first time that I have used glitter or markers on a shirt any special instructions on washing. 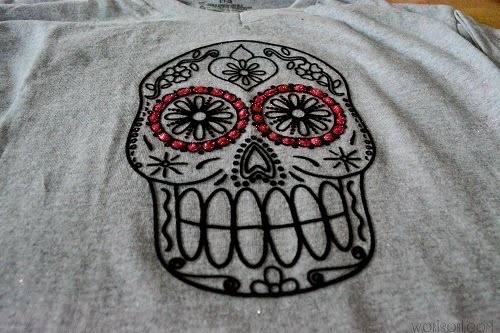 Don't want to ruin my amazing creation so inspired can't wait to make another design. 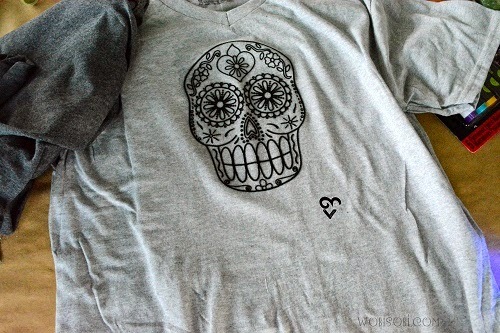 Thank you so much:) Wait about 3 days before you wash then wash in cold water under the gentle cycle and hang dry.